Paris, France (CNN) -- Five paintings, including a Matisse and a Picasso, were stolen overnight from a Paris museum, the Paris mayor's office said Thursday. The paintings were stolen from the Museum of Modern Art and included works by Georges Braque, Ferdinand Leger and Amedeo Modigliani, French police said. The artworks are worth a total of just less than 100 million euros ($123.7 million), said Christophe Girard, an aide to the mayor of Paris. The city runs the museum. The city of Paris Web site named them as "Le Pigeon aux Petits Pois" (Pigeon with peas) by Picasso, "La Pastorale" (The Pastoral) by Matisse, "L'Olivier pres de l'Estaque" (Olive Tree near the Estaque) by Braque, "La femme a l'eventail" (Woman with Fan) by Modigliani, and "Nature morte aux chandeliers" (Still Life with Candlesticks) by Leger. Paris Mayor Bertrand Delanoe said he was "particularly saddened and shocked by this theft which is an intolerable affront to the universal cultural heritage of Paris." Delanoe said in a statement that part of the museum's security system -- the part that detects movement and body heat -- had been broken at least since March 30. The museum notified the service provider that day and asked for replacement equipment, but it still has not been provided, the mayor said. 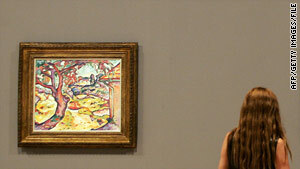 Video surveillance of the museum was working normally, and three guards were on duty, he added. Delanoe called for an administrative investigation in addition to the criminal one, he said, to determine if "technical or human failures helped make this security breach possible."